Pictured is above is a portion of a railroad bed on Maple Street owned by the city. The orange portion denotes the area Marysville city officials are considering selling to adjoining business, Celebrity Hats and T-shirts. City council discussed the sale Monday evening. The City of Marysville is considering selling a piece of its property on Maple Street to allow a local business to expand. City council members discussed the matter at a work session Monday night. City Engineer Jeremy Hoyt said about a year ago, Celebrity, a company that offers screen printing and other graphics printing services at Maple Street and Collins Avenue, approached the city. Celebrity Hats and T-shirts owner Clay Moore spoke to officials about the possibility of purchasing a piece of land next to the business. “He wasn’t sure exactly what he was going to do with it, but he knew that it benefitted him to be able to do that,” Hoyt said. The land is part of a former railroad bed the city owns. Hoyt said the city will keep a portion of the railroad bed, since officials could decide to put a path there in the future. “At least that’s where we’re at,” Hoyt said. The land in question has been appraised at about $500. Hoyt noted the city isn’t allowed to simply sell the property to the business. He said it must first go to auction, and said the city won’t necessarily have to sell to the highest bidder. Councilperson Mark Reams said this issue came up “years ago,” since there’s a fence that extends from the business’ property onto the city-owned land. Reams said at the time, the city decided to let it go, though chose not to sell the land. He said if the return is only going to be $500, it isn’t worth selling. “That was purchased, I think, for a bike path,” Reams said. Reams also noted Celebrity’s plans don’t seem set in stone. Hoyt said it’s not a question of “if,” but “when” the business expands. City Manager Terry Emery said Celebrity’s current situation limits what the business can do. “I would like for us to think about the possibility of allowing this for the possible enhancement of a business,” Emery said. Councilperson Henk Berbee asked Hoyt about the likelihood of ever using the property as a city street that could cut straight to London Avenue. Councilperson Alan Seymour asked for a map of ownership for the former railroad bed. 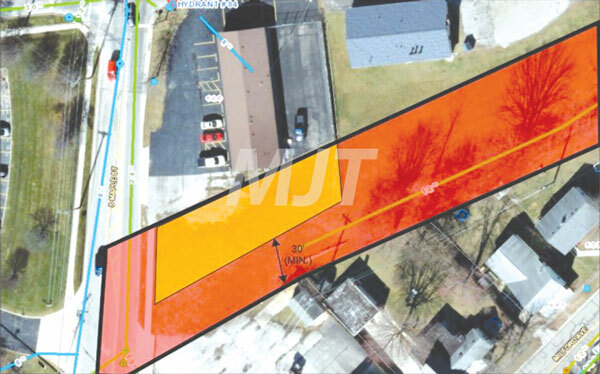 Hoyt said the city owns the bed from Maple Street to Plum Street, but the bed extends from the railroad on Delaware Avenue, and then all the way through the city to Milford Center. “I’d like to see the ownership from corporation limit to corporation limit to see how fragmented it really is,” Seymour said. Reams asked if the land officials are considering selling could be altered to have the southwest corner be more angled. That way, if the city does ever put a path in the railroad bed, it’s less of a sharp turn onto Maple Street. The sale of the property will come to the next Marysville Public Service Committee meeting later this month.